Warning… Warning… We have an important announcement to make… As you all know, it’s a special year for us: Kozzmozz celebrates its 20 Years of existence! This will be the third celebration of this big anniversary and we can assure you, it will be a special one. We aliens from planet K remember our first foot upon your earth like it was yesterday. The goal was to help earthlings with their hunger for advanced techno music. We came a long way, we made a lot of flights, but there’s always the thrill of just the beginning. And that’s why we’re going back to our roots in September. 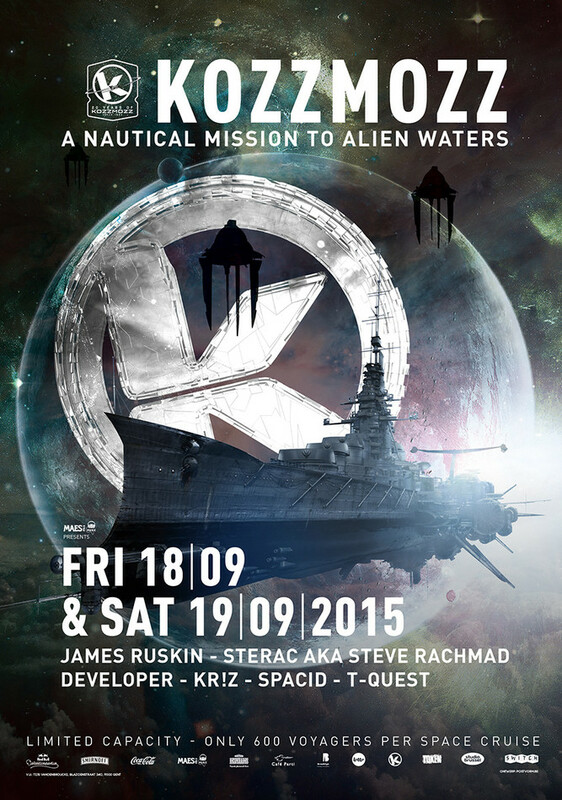 Who of you can remember checking in at our first parties on space boat, Jozef K? Unfortunately that spaceship became too small very fast, as more and more of you wanted to be part of our travels through techno hyperspace. So for this special edition we’re going back to our roots, into the alien space where the stars are other suns. We traveled through time to find the perfect floating vessel for this exclusive flight. And yes, we found it, and this time we will also float over the waters of planet Sram with our beloved techno commanders. It will be a long and unique mission… After splashing down on planet earth, our floating space cruiser will make its way into inland waters over the course of a trip lasting two days. Earthlings can enter the space boat the first time on September 18. Should you miss the first take-off, you can catch the next flight the following day, September 19. In the beginning our cruise ship will have no means of propulsion, it will float, carried by breezes across the water surface. But when the moon’s orbit takes it to the dark side, the real lift-off will take place… The space boat will be pushed forward on the waves of techno darkness. Earth will be far away and all you’ll have to do is enjoy this exclusive, nautical mission to alien waters. Several of our most beloved and earliest commanders, as well as one new star on the horizon, will navigate our space vessel. Grown up in London and in the music business for more than 15 years now, James Ruskin is considered as one of the main artists for British electronic dance music. With releases on his own Blueprint label, Coda and Tresor, he set new standards in production techniques and got an excellent worldwide reputation. James´ DJ skills have secured him a number of international tours throughout the world and he regularly plays at the world´s best venues such as Fabric (London), Tresor & Berghain (Berlin), U60311 (Frankfurt) and many others. His last album ‘The Dash’ was also released on Tresor and together with Regis he forms the incredible O/V/R project. He joined us on many travels over the past decade, most recently on our last landing on Tomorrowland and we’re very happy to welcome him back on these intimate space cruises. Next up is Sterac aka Steve Rachmad who first joined us when our main docking station was the Jozef K boat. He later became a long-time Kozzmozz resident in the huge Kuipke space station. Since his earliest productions, Amsterdam’s electronic music pioneer Steve Rachmad has created a legion of monikers for his various compositions. One of the main characters living on Planet Rachmad has always been Sterac with a focus on the no-nonsense, darker and deeper side of techno. The Sterac discography consists of classic tracks on labels such as M-Plant and Tresor, with the 2012 remixes ( by Ricardo Villalobos, Joris Voorn and Marc Romboy to name but a few) of his legendary album ‘Secret Life of Machines’ (1995) demonstrating the lasting quality of the Sterac oeuvre. More recent releases appear on Klockworks and Delsin, while his schedule takes him on tours to the world’s finest clubs. It’s been a while now since we had him over but he could not be missing from this trip into memory lane. For Developer it will be his first visit to Planet K but we are convinced he will fit right in. Over the last two decades he played alongside many elite techno talents from around the globe and took a part in laying a foundation in the LA techno culture by producing events and bringing various first time international talents throughout the mid 1990s to 2008 to the city. Developer gained much of his acclaim and extensive performance history from his strong marathon sets and quick programming skills as well as the ability of playing 50 tracks per hour on 3 turntables with effect processor and sampler. Since founding Modularz in 2008, Developer has been focusing on his label which now has seen over 20 releases, making it one of the most sought-after modern techno labels. It combines a series of strong releases of own music (Developer Archive Series) with new and existing talents. Next to that he also releases on labels like Luke Slater’s Mote-Evolver, Oscar Mulero’s WarmUp and Pole Group. We are also very happy to welcome our longest resident ever to the boat. T-Quest held a residency on the K flights since day one, for over 10 years. He later got abducted to another green planet but revived his techno alias very occasionally for our birthdays and will do so, on this one once again. He’s the man behind the revered Music Man label, of which so many artists were featured on Kozzmozz throughout the years. Next to being a resident at Kozzmozz for almost 7 years now, Kr!z’ dj-schedule currently takes him around the world including leading institutions as Tresor and Berghain in Berlin. This has everything to do with the unprecedented success of his Token Records label. With more than 40 releases to its name, Token is now one of the most respected techno-labels of the moment. And also Spacid has been part of the K crew for many years. He has been promoting underground electronic music since 1992 and knows how to bring the K crowd up to light-speed like no other. He will warm up the ship so it can float well prepared into the realms of that wonderful world called techno.